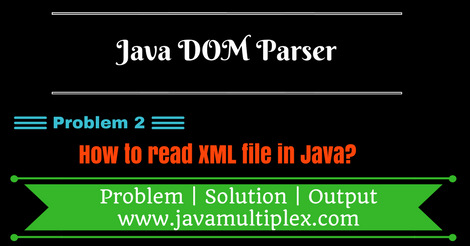 How to read XML file in Java using DOM Parser? Home DOM Parser How to read XML file in Java using DOM Parser? 2) Get the root element of XML file. It returns Employees node. 3) Get all the child nodes Employee of root node Employees. It returns the instance of NodeList interface present in org.w3c.dom. * package. 4) Now one by one examine each child node Employee and extract its data. From all the child nodes that we got in Step 3 take one child node. It returns instance of Node interface present in org.w3c.dom. * package. Check whether this node is Element node or not? If it is an Element node then typecast it and get its data (attributes and properties). Get attribute value as below. Get property value as below. How to create XML file in Java using DOM Parser?